What happens when a terrorist is about to be captured alive or a belligerent is detained by the another party ,,,,,,,He swallows a small cylindrical pile and becomes unconscious by the next second and dies within a few moment after. Well have you ever imagined what actually he owned?????? A Poison, a Narcotic drug or a Pain Killer??? He carries CYANIDE with him....CYANIDE....a child that pertains to the Nitriles Group and the deadliest drug even prepared by the chemists. The different forms of CYANIDES are Hydrogen Cyanide (HCN) and its salt derivatives Potassium Cyanide (KCN), Sodium Cyanide (NACN), Trimethylsilylcyanide etc. Ufffff old school stuff, so just dump them. Lets check out the effects we have inside our body after any of them is taken into. As soon as Cyanide is taken cellular respiration is blocked. The attack is upon the Mitochondrial Cytochrome C Oxidase(the carrier molecules in Mitochondria of the cell that contains iron proteins and produces cell energy in the form of ATP ) that later results in blocking oxidative Phosphorylation(addition of Phosphorus to a molecule). Food oxidises but body stops producing energy from it. Lactic Acidosis(Production of Lactic acid in the blood that gives us the feeling of pain in the joints and being tired) Occurs due to the anaerobic Metabolism(conversion of sugar to acid). Body and face gets red or ruddy because tissues are not able to use O2. People lose consciousness and dies over a period of time. Convulsion(abnormal movement of body) and eyes might roll back due to Hypoxia(deficiency of oxygen) of natural tissues. Amount of KCN taken(200-300 milligram is ample for the effect to take place). Acidity of stomach to convert itself into HCN from KCN. When your house catches fire it is very likely that you inhaled smoke and got HCN poisoned. 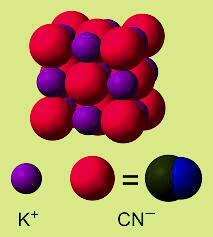 Cyanides mainly affect the central nervous system and the heart. Plants are not affected by any form of Cyanides because they have alternate pathways for respiration. The Giant Bamboo has excessive amount of Cyanides in their shoots. The Golden Bamboo Lemur is able to consume Giant Bamboo shoots that has lethal dose but has no ill effects on it. Absorption through skin is not as lethal as ingestion.